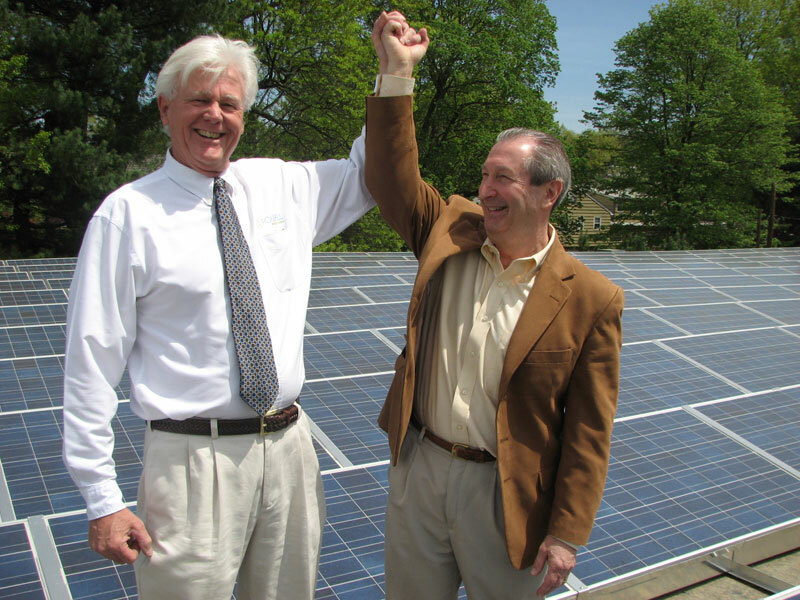 Charles Wantman, right, and Don Powell show off their handiwork in a visit to the Oheb Shalom roof following the solar panel dedication ceremony. As the sun beat down on the roof of Oheb Shalom Congregation in South Orange on the morning of May 1, about 50 congregants and religious school students gathered to dedicate the synagogue’s recently installed solar panels. The 575 panels are expected to provide about 60 percent of Oheb Shalom’s energy needs. “We’re a religious organization. We’re supposed to take care of the world. Here’s one way to do it,” said member Charles Wantman, who conceived the project several years ago and brought it to fruition. “Next to my son, this is the most fulfilling thing I have done in my life,” he said. The congregation’s Rabbi Mark Cooper said he hopes the project will inspire other houses of worship in the area to undertake similar steps at environmental conservation. At Oheb Shalom, he said, the installation will serve as a kickoff for other “green” endeavors, including putting together a teen team to get involved in a variety of environmentally friendly projects. One step already taken was replacing all the fluorescent light bulbs in the synagogue with more energy-efficient bulbs. Oheb Shalom follows Temple B’nai Abraham in Livingston and Temple Ner Tamid in Bloomfield, the first in the area to install solar panels, in 2006. Greenfaith, a faith-based environmental organization founded and headquartered in New Jersey, helped the three synagogues make the appropriate connections needed to move the installation forward. While the idea to install solar panels on synagogues isn’t new — the first was Temple Emanuel in Lowell, Mass., in 1978 — there are only a handful in northern New Jersey that have taken the step. 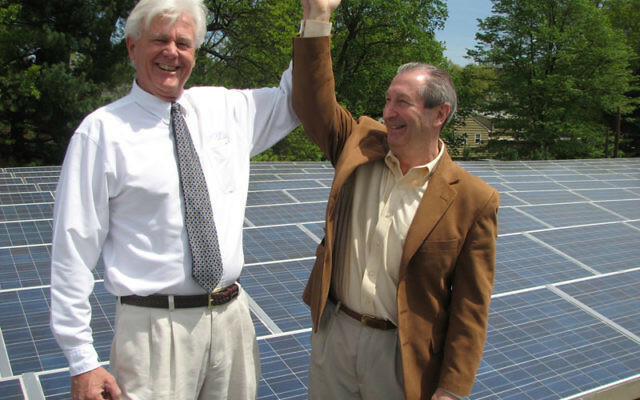 A small company in Moorestown named Powell Energy and Solar installed the panels at no cost to Oheb Shalom. In return, Powell Energy and Solar gets the benefit of a New Jersey state tax credit, and then provides electricity to Oheb at a rate significantly lower than that charged by PSE&G, typically about half. At the dedication ceremony, students enacted a skit about stewardship of the Earth in the Garden of Eden, and former president Abe Bunis read an original poem thanking God for the blessings of the sun. Wantman, joined by synagogue president Michael Schechner, flipped a symbolic switch, ceremonially recognizing the beginning of a new energy era at the synagogue. South Orange Village president Douglas Newman joined the congregation for the festivities.